Designed to replace crystal oscillator LO chains for microwave receivers and transmitters used by Amateur Radio operators. Now there is an inexpensive alternative to those unstable high frequency crystal oscillators which drift constantly, allowing precise receiver/transmitter frequency settings using a stable external 10 MHz or 100 MHz reference oscillator like a TCXO, Oven Controlled Oscillator or a Rubidium Oscillator. 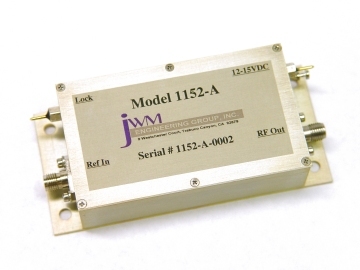 One of the frequency options allows the Model 1152-A to be used as a Microwave Beacon driver source between 1296.8 MHz to 1297 MHz. The Model 1152-A outputs one of 8 selectable frequencies listed in Table 1 and Table 2. Using external frequency multipliers, the Model 1152 base frequencies will provide local oscillator power for the following microwave bands, with the corresponding receive/transmit IF frequencies shown in Table 2. NOTE: Custom frequencies are available on special order. Consult JWM Engineering Group, Inc. for information and pricing.